Oil exploitation leaves trail of pollution and death in the Peruvian Amazon. This is a letter written by Alexander Ricopa Fasabi, a 9-year from the Kukama town of Santa Clara, in the department of Loreto, along the Marañón River, to President Ollanta Humala and his wife Nadine Heredia. Ricopa, along with dozens of other indigenous children, want to draw attention to their community´s situation. The protest by the children has been a new and desperate attempt by the Kukama to be heard by the political authorities. The initiative was designed by Miguel Ángel Cadenas and Manolo Berjón, two tireless Spanish Augustinian priests who live among the Kukama in the town of Santa Rita de Castilla, and who for years have been fighting with heart and soul for the rights of these people. They developed their plan of action by working closely with the Cocama Conservation and Development Association of San Pablo Tipishca, part of the Indigenous Peoples of the Amazon United in Defense of their Territory. The situation is unsustainable: the pollution in the northern Peruvian Amazon has jeopardized the physical — but also the spiritual — wellbeing of the indigenous communities. During 2013 multiple environmental emergencies were declared, one after the other, in the basins of the Pastaza, Corrientes and Tigre rivers. Finally, in May, the Peruvian government declared a state of environmental and health emergency in the area of the lower Marañón River. These decisions were all taken with embarrassing delay considering the extent of the damage and complaints. 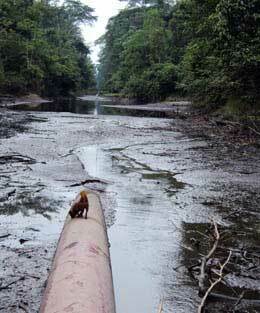 Oil exploitation in this part of the Peruvian Amazon began in 1971. A pipeline of over 16 km (10 miles) crosses through the forest and indigenous territories, transporting every day thousands of barrels of oil. As this structure is over 40 years old, it already shows signs of age: the pipes are badly damaged and the connections are in precarious conditions. Before, the oil spills occurred around the drill holes, but now they are becoming more frequent and consistent throughout the pipeline. In the last five years alone, more than 100 spills have been documented, according to the Arkana Alliance, an international organization that advocates on behalf of peoples of the Amazon region. In addition to these oil leaks, there are spills, which were the norm until at least 2009, of the so-called “production waters” into the rivers. These “production waters” are salty, very hot (80°C to 90°C, 176ºF to 194ºF) and are contaminated with petroleum, heavy metals (mercury, cadmium, barium, lead, arsenic, etc.) and radioactive elements. The consequences of the leaks and spills are devastating for the flora, fauna and surrounding populations. With exposure to everyday pollution, people can contract very diverse illnesses, some of which are very serious or deadly, such as tumors, kidney failure and nerve damage. The party responsible for these environmental issues is Pluspetrol North, a company that belongs to the Argentine oil company Pluspetrol. It operates in lot 1AB (drilled by U.S. oil company Occidental Petroleum until 2000) and lot 8 (which belonged to the state company Petroperú until 1996, and which is divided into five separate smaller lots). The lots are located on the basins of Corrientes, Tigre, Pastaza and Marañón rivers and part of the Pacaya-Samiria National Reserve (lot 8X). Today, the waters of these rivers as well as large areas of the reservation are highly polluted. Some sites have even disappeared, such as the Shanshococha lagoon, which was near lot 1AB. Denying the disastrous conditions the pipelines are in, the company defends itself by claiming that the pipeline leaks are caused by acts of sabotage and vandalism committed by people from the indigenous communities. As for the “production waters”, the oil company points out that for some years now the waters are injected underground. However, it´s important to remember that for more than a decade, Pluspetrol has spilled up to 1.1 million barrels of “production water” per day into four rivers, all tributaries of the Amazon River. Finally, the oil company accuses its predecessors Occidental Petroleum (Oxy) and Petroperú of damaging environmental sites. This is partly true, but the indigenous organizations state that, when Pluspetrol took over the oil concessions, it also assumed responsibility for repairing previous damages. The most widespread fear is that the contamination is already too severe and that decades, if not generations, are needed to regain some balance in the ecosystem. Meanwhile, Cadenas y Berjón observe the Kukama community lives surrounded by violence, both external (clashes with the state and companies) but also internal (drunkenness, domestic violence, suicides). “Working in harmony with the environment and the community,” says the propaganda distributed by Pluspetrol. A joke that would make anyone blush, except the Argentine oil company and the political authorities that have until recently protected the company. —Latinamerica Press.